It was always going to happen. It was only a matter of time. That’s the When. The other variables to consider were the Where and the Who. Both would likely be connected. Some had previously guessed answers. Wrongly. And here we were. Still awaiting the When that would provide us with the Where and Who. The great and the good had arrived as guests, were vanquished and departed. There were welcoming arrivals on foreign shores too. Still nothing. We waited. It would come. Time moved on. And then it arrived. 10th October 2014. That’s the When. The Where was a less than salubrious location. Picturesque but not grand. The stadium under the hill. The Duben hill to be precise. The home of MSK Zilina in north western Slovakia. For some it was a new sensation. For three individuals, this had occurred before. Casilas, Iniesta and Fabregas. They had experienced this sensation before. A defeat in a qualifying game. 35 games and 8 years since the last defeat in qualifying. Then it was Sweden. Now it was Slovakia. We know the When, the Where and the Who but Why? That’s the question. For so long, selecting the Spanish side took care of itself. The spine of the team arrived from Barcelona with key personnel from arch rivals Real Madrid. One or two others took the final places. The first XI took care of themselves. That Barcelona were leaned upon so heavily enabled the seamless transfer of their style of play to the national set up complemented by the likes of Xabi Alonso offering his long range passing in midfield. The building blocks were positioned. And almost permanent. Now though, the spine of that has been removed. Not incrementally but immediately. The lynchpin and the fulcrum of the side has departed. Xavi Hernandez has retired. Add to this the loss of Xabi Alonso, Carles Puyol, David Villa and the decline of Casillas and Torres and the issue is brought sharply into focus. Yet for each of the players mntioned thus far there is an able deputy, willing to take up the vacated slot. One position remains to be filled. There is nobody sitting in deep midfield to cajole and prompt. We are left with a plethora of central attacking midfielders shoehorned into the side at the expense of both width, and more importantly, a clear idea. For the incorporation of that Barcelona spine brought a clear ideology to la Roja, exemplified by Xavi, who sat deeper and was able to dictate play. Now Spain has plenty of possession but no clear vision of the game. They are not in control. Moments arrive on the back of individual play as opposed to the collective. Now, we see the Spanish side drawn form a number of teams, each with their own competing ideals. The passing of Barcelona is still there, the influence of Real Madrid has reduced and we have the counter attacking, combative element from Atleti. There is no clear defining idea now. No winner amongst the competing ideologies. The mix has become wider, the style blurred. And we arrive at the central dilemma for Spain now. It’s not about the style they pursue, that much is obvious. The central tenant of play that brought them this far will remain in place but evolution is needed. Therein lies the issue. Who will be the man that leads Spain to find that revised style. Many labelled Spain’s exit from the World Cup as the final nail in the coffin of tiki taka. An assertion that is sensationalist, lazy and wrong. You don’t overthrow your entire footballing philosophy because of a few performances. This style of play, the possession dominated short passing of Spain, has brought la roja this far. It needs further evolution and not a revolution. The style has to adapt. Sadly, I doubt that Vicente del Bosque is that man. A loyal coach and a man who has overseen a period of unprecedented success following on from Aragones. A coach who will remain faithful to the men he trusted time and time again to deliver for Spain but he probably went too far this time. A period of adjustment was required, ideally during the qualification for this World Cup. A time for the gradual adaptation of the squad. Changes were needed but these were limited and constrained. The inclusion of Diego Costa has been a grave error. It led to Spain beginning to abandon their style and beliefs as they tried to hit long through balls for Costa to run down. No other side at the 2014 World Cup attempted as many through balls as Spain, averaging 10 per game. It’s a convenient falsehood and lends weight to those who would support this argument. It ignores the fact that the through balls have always been a part of the Spanish game. Remember Torres running onto a pass to score in the Euro 2008 Final? Or Jordi Alba running behind Italy to latch onto another through ball in the Euro 2012 Final? At Euro 2012, Spain averaged 15 attempted through balls per game, higher than the World Cup in Brazil. The problem is teams sit so deep against Spain that space in behind is at a premium. Costa has little room to work. The challenge for Spain is enabling Costa to find that space. The formation needs altered to help create the space for Costa to thrive in. With no dictating force in midfield, the play will inevitably be a little more direct. And chaotic. Nobody is organising. Nobody is taking control. And players all fight to occupy the centre ground. The problems have existed for some time now and become clearer with each passing game irrespective of the final outcome. Poor opposition can be overcome through individual moments of quality but that cannot be sustained. Defeat in Slovakia was followed with a comfortable win for a young Spanish side in Luxembourg. Early promise, however, must be tempered by the quality of the opposition on this occasion. The first decision to be made surrounds del Bosque and if he is the correct man to take Spain forward once more. Were it not for limited alternatives, I suspect he would have already departed. The second issue revolves around squad selection. Some players, irrespective of how talented they are individually, need to be removed and replaced by technically inferior players but players who can help provide the correct balance for the squad. The experiment with a team packed full of midfielders is over. It’s time to move on. The question is When? Malaga and Barcelona clashed at La Rosaleda last night in the first of three games in ten days for the clubs with the sides meeting in the forthcoming Copa del Rey tie. The first blow in this triple header went to Barcelona. Given the display that Barcelona produced, few would now bet against a clean sweep of three successive victories against the Andalusian’s. There were two changes to the Malaga side following their 1-0 loss away to Deportivo. Jesus Gamez was replaced by Sergio Sanchez at right back and the defensive midfielder Jeremy Toulalan came in for the more offensive Portillo in midfield. Pellegrini chose to use a double pivot in midfield to try and compete against Barcelona. There was just one change to the Barcelona side that had dispatched Espanyol so convincingly last week with Mascherano replacing Puyol in central defence. Iniesta continued in the attacking left hand position with Cesc accommodated in midfield. The Chilean was quite clear pre-match what he expected from his side and they tackled the challenge with the style we have come to expect from a Pellegrini side with a twist. With Roque Santa Cruz as the central striker, Malaga had a physical reference point in attack who could be used to hold the ball up and win aerial battles. It worked to a degree. 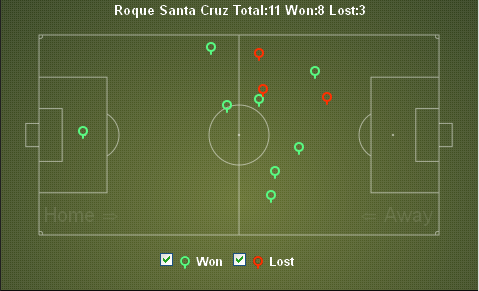 Santa Cruz won a number of headers and was able to retain a presence in attack but his skills were diminished when he moved wide lacking the pace and mobility of a Saviola. Furthermore, he never managed a header in the opposition box. He was operating deep and looking to find Joaquin and Isco from flick-ons. Isco had one of his quietest games of the season whilst Joaquin offered a number of surging runs but lacked quality in the final third. The remainder of the Malaga team had a familiar look to it. Although employing a double pivot of Toulalan and Camacho, the home side still maintained their customary short passing game. During the defensive phase, the side dropped back to a 4-4-1-1 with Santa Cruz left upfield and supported by Isco. Joaquin was always prepared to join them. The remaining seven players performed the defensive function. By leaving players in attack, Malaga prevented Barcelona from becoming encamped in their half of the pitch, always weary to the threat posed by los bocquernos. The effort required to sustain a challenge against Barcelona inevitably took it’s toll and tiredness set in enabling Barcelona to dominate much of the second half. The game opened with both sides seeking to impose their style on the opposition. Both teams were pressing the opposition goalkeeper when in position forcing long kick outs. With the quality on both sides, winning the midfield battle would be key. Early on Malaga competed well and forced Barcelona back. It is unusual to see a Barcelona side defend with the entire team back but that occurred during the first half. The Malaga players are clustered vertically whilst the Barcelona midfield and full backs are positioned horizontally. With Messi drifting laterally in front it creates ideal passing triangles. The position of Dani Alves is extremely high, almost level with Pedro. Iniesta and Cesc are side by side, ready to swap places as the situation develops. Sanchez was often isolated at right back with Joaquin further forward and cutting inward. Such a move simply aided Barcelona’s left. 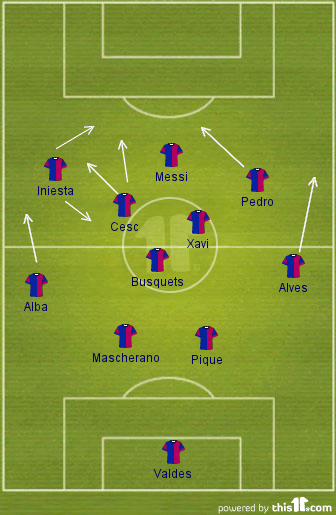 Against Espanyol, the interplay and positional changing of Iniesta and Cesc was a key component of the victory. These players linked yet again against Malaga to provide Barcelona with an alternative to the reliance upon the right side of the team where Pedro, Messi, primarily, and Alves operate. The above heat map shows the tendency for attacks entering the penalty area to be on the left hand side. It’s a theme that has been developing recently and only looks like increasing further through the combination play of Iniesta, Cesc and Alba. The lack of penetration on the right is heightened by the tendency for Pedro to drive diagonally inward and act as a No9 when required. It leaves Dani Alves alone to patrol the right flank. With the game finely balanced although Barcelona were enjoying more possession, the opening goal would be pivotal. That it arose via a defensive blunder considering the quality on offer was a surprise. Camacho hit a back pass to Cabellero failing to see that Messi was some way behind the Malaga defence. The forward was able to intercept the pass and round Cabellero before slotting home. Fabregas scored shortly after half time. As with all Pellegrini teams, Malaga hold a well organised defensive line and attempt to stay relatively high rather than falling back. This time however, Weligton dropped deeper than his team mates and Fabregas was able to run in behind Sanchez for the second goal. The real moment of genius here though was the chipped pass from Messi, weighted perfectly for Fabregas to run onto. The goal was further evidence of the positional changes which Barcelona can now utilise. Iniesta was supposedly on the wide attacking left position, but at the goal he was in a central position and Cesc Fabregas was wide on the left. The constant movement and interplay making it increasingly difficult for opponents to successfully defend. This level of understanding comes to fruition after a considerable time period. It’s not easily learned. The second goal killed the game to a certain extent. Barcelona dominated possession and Malaga only offered minimal threat sporadically, both teams sensing that the contest was over. It led to a situation of less pressure for Barcelona and some fantastic midfield passing movements helped by their horizontal positioning noted above. Barcelona now also possess the ability to attack teams quickly during transitions. The qualities have always existed but are now being employed. In the 63 minute, Barcelona attacked swiftly following a Malaga corner with Pique leading the break. This has been an underused weapon within the arsenal for some time but there are signs it is being used more frequently now. The third and final goal for Barcelona was an individual effort from Thiago. Collecting a throw in on the right, he easily evaded poorly attempted tackles from Iturra and Camacho before drilling the ball low past Cabellero. Barcelona has now gone nine games home and away without defeat against Malaga with Messi scoring ten goals in his last ten games against los bocquernos. Buonanotte scored a consolation goal, a lovely free kick curled over the defensive wall. It was a deserved goal considering their efforts. An unprecedented league campaign for Barcelona thus far. Eighteen wins and a solitary draw in their nineteen matches to date. Vilanova has already acknowledged that a repeat of such form in the second half of the season is unlikely but given their recent form, could Barcelona at least remain unbeaten for the duration of the season? Montanier made the unusual choice of beginning the game with the club’s joint top scorers from last season both on the bench alongside him. 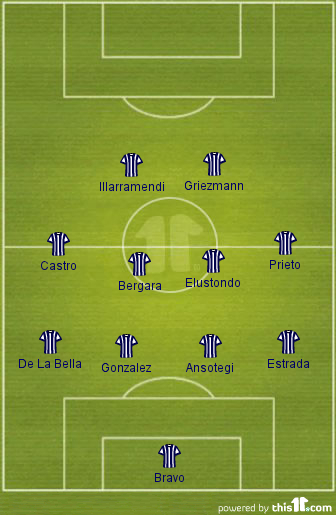 Griezmann started in attack alongside Illarramendi with new signing Castro making his debut on the left wing. Sociedad adopted a 4-4-2 formation at the outset of the game. Whilst examining the Barcelona performance in closer detail, it must be remembered that this was a Sociedad side that were prepared to use two strikers and tried to attack. It’s doubtful if many opponents will arrive at the Camp Nou this season with such an outlook. The approach was tempered somewhat after the half time interval when Illarramendi dropped deeper to form a midfield five to stem the tide flowing towards the Sociedad goal. A 4-5-1 formation was utilised from this point onwards with Griezmann becoming isolated as the lone striker. The game began in explosive fashion with four goals in the opening fifteen minutes. What was most interesting though was the intensity which Barcelona were displaying. The side appeared reinvigorated and pressed Sociedad as soon as possible, forcing the Basques onto the back foot. The passing was quick throughout as Barcelona seemed to rediscover the hunger and desire that had been lacking during parts of last season. Barcelona also sought to open up the play with crossfield diagonal passing occurring to both full backs and wingers, stretching their opponent and turning the Sociedad defence. With a 4-1 half time lead, the second half revolved around retaining possession for Barcelona, mindful of the upcoming Super Cup fixture against Real Madrid. The final goal was scored by Villa who made his first competitive appearance since his injury in December 2011. Given that this was as straight forward an opening fixture for Barcelona as you are likely to witness, it is worth considering a few key points which could be indicative of how Vilanova wants his Barcelona side to play. Clearly, these are early days in the Vilanova regime and we must not make any rash judgements nonetheless there are learning points here. Speculation has surrounded Tello during the close season and he still retains a B team squad listing although he has been advised he will feature for the first team. Whilst his starting role may have surprised many, it was entirely justified following an excellent performance which witnessed two assists in the first half. Making the breakthrough at the same time as his colleague Cuenca inevitably leads to comparisons despite both being very different players. Tello was able to thrive against Sociedad as the Basques were very attack minded which allowed Tello to use his pace to good effect. Holding a wide position, there was ample space behind the Sociedad back line for Tello to drive into. Against a deeper lying defence, Tello may find his pace is not as useful with limited space on offer. He provided snapshots of close control and played a lovely cross for Pedro’s goal. His decision making and final ball are two areas needing further development if he is to be considered as something other than just an extremely fast player. Last night suggested he may have a role to play in the longer term. Both Dani Alves and Jordi Alba pushed high up the pitch and supported their respective winger especially Alba who impressed on his home debut and overlapped Tello on a few occasion when the opportunity arose. Over the past few seasons we have become accustomed to witnessing Alves bomb forward on the right whilst Abidal adopted a more conservative position on the left alternating between holding the left back position around the halfway line or forming a defensive trio by slotting in as the left sided centre back. With Alba playing, this option of conservatism is removed. Whether such an approach would be encouraged against higher quality opposition remains to be seen. Sociedad scored the equalising goal when Castro moved in behind Alves, hitting the ball high into the roof of the net. The space existed not because Alves was caught high up the pitch but due to poor positional play. Alves moved infield, far too close to Puyol which provided Castro with the space to control the pass from Illarramedi before scoring. Will the left flank of Barcelona prove to be stronger than the right flank this season? Given the role which Dani Alves has fulfilled over the past few seasons, it seems inconceivable but last night Alba provided evidence of his attacking ability allied to the defensive side of his game which he learned under Unai Emery. Furthermore, can Barcelona really play with both full backs being so attack minded? Will the midfield need to compensate? There were two interesting features in the Barcelona midfield. 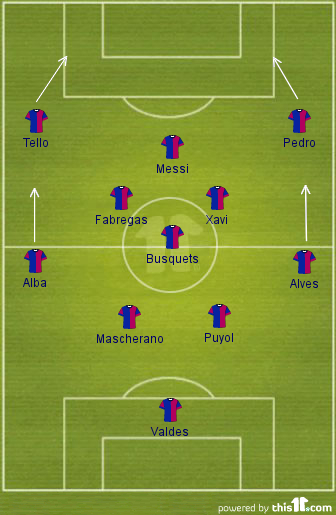 Firstly, Fabregas was in the team as a midfielder and in place of Iniesta. This required Fabregas to drop deeper on occasion which he did although he still linked with Messi when permitted. There appeared to be greater fluidity between the three midfielders. This was aided as, secondly, Busquets played in a fairly high position on occasion especially during the first half when he pushed up to lend support to the trio of Xavi, Fabregas and Messi. Although still ostensibly the defensive midfielder in the team, there was greater movement between Busquets and the other two midfielders. This increased movement was necessary as the duos of Alves and Alba and Pedro and Tello were holding very wide, high starting positions. Without Busquets pushing on, Barcelona would have been left numerically outnumbered in the centre of the pitch. The impact of pushing Busquets further forward meant that Barcelona only had Maschearno and Puyol defending. Are Barcelona going to play more aggressively this season? There are relatively high hopes for Sociedad this season. Coach Philippe Montanier has a talented, if mainly youthful, squad at his disposal and coaxing the maximum from those at his disposal could reap rewards. The disappointing result from last night must not be allowed to adversely affect team morale. The first step in the Vilanova era for Barcelona and one which hinted at some subtle alterations whilst demonstrating that the side has lost not of the hunger and desire which drove them to such success over the past few years. This was no tactical success in this game. Simply, Barcelona had vastly superior players to their opponent. The upcoming Super Cup games against Real Madrid will provide a significantly sterner test of Vilanova’s tactical acumen. Spain retain the European Championship with an emphatic display against the Azzuri and in doing so, break yet more records. Away from the record breaking achievements, this was a result which provided a resounding answer to those critics who had wrongly claimed Spain were boring during this tournament. This was a performance marked by supreme technical quality, pace and above all, an aggressive streak which had been missing from Spain. From the outset of this match, Spain went for Italy. Spain began the match with the same starting eleven that had faced Italy in their opening group game. In doing so, Spain created their first piece of history as no previous finalist had used the same eleven in the final and their first group game. The Negredo experiment had failed and Cesc Fabregas returned to the starting line up as the false 9. Despite suggestions that Navas or Pedro would start, David Silva retained his place. Cesare Prandelli had more to consider but resisted the temptation to revert to a 3-5-2 as he had done in the group match against Spain. One change was made, Balzaretti being replaced by Abate at right back. Italy broadly lined up in their 4-4-2 diamond which has served them so well in recent game but with a couple of interesting features. As against Germany, Chiellini looked to get forward as much as possible from the left back position when Italy had possession. At this junction, the team shifted to something along the lines of 3-5-2. With Chiellini pushing very high, De Rossi dropped into a central defensive position to form a back three. This also provided Italy with an alternative option for passing should the midfield area become congested. The opening minutes saw Italy try to establish a foothold in the match, similar to the approach adopted by Portuguese against Spain in the semi final, with pressing high up but Spain responded and took over. The passage of play around the 10th minute showcased all of the Spanish attributes. The quick passing and movement coupled with the aggressive intent. Xavi and Iniesta both had shots blocked before Xavi shot just over from 20 yards. Spain had moved up a gear from anything else they had produced in previous performances in the tournament. Despite his wide position in attacking phase, Chiellini tucked in when defending yet Iniesta was able to thread a pass through to the on running Fabregas, himself making the sort of run typical of a striker, and the subsequent cross was converted by Silva. Despite falling a goal down, Italy responded well and enjoyed their best period of the match. The Italian midfield worked extremely hard to close down their opponents and build attacks. For all of the praise of Spain, this was a period when they lacked control. They were unable to dictate the tempo of the match. The Italian midfield was able to gain temporary superiority over their counterparts from midway through the first half. There were two main reasons for this. Chiellini had received plenty of space early on with Arbeloa his only direct opponent. Silva, deployed on the left for the opening few minutes, was tucking in far too much. The Italian left was strengthened through adversity when Chiellini was forced to go off injured after 20 minutes. Balzaretti replaced him and continued to enjoy space on the left. A much more adventurous left back, Balzaretti linked well with Cassano during Italy’s best period of the game. The space was granted due to concerns surrounding the potential for Pirlo to have an effect on the game. Both Iniesta and Silva were tucking in far too centrally. The Italian outball, as it had been against Germany, was on the left. Pirlo was closed down quickly primarily by Xavi but also by whichever midfield player was closest to him during that particular phase of play. The result of which was Pirlo being forced to pass quickly to team mates whilst being pressed. He was seldom able to lift his head and pick out a pass. Italy missed the opportunity to go long towards Balotelli and turn the Spanish backline. The second goal arriving just before half time changed the dynamic of the game once more. It was the result of two elements. Xavi Hernandez and Spain’s increasing vertical play. From Casillas kick out, it took just 14 seconds until Alba scored. This has been a tricky tournament for Xavi. He has rarely hit top form in what could be his last major competition. If that is to be the case, last night provided him with the opportunity to display his talents once more. Again, he started in an advanced position but this time he was surrounded by movement. He had options to pass to. There were forward runs on the flanks, Fabregas was moving in behind the defence and Busquets and Alonso were positioned slightly deeper. The midfield was Xavi’s and he took hold of the game. The first half goal’s altered the dynamic of the game considerably. The Italian’s were never going to park the bus but space opened up as Italy sought a way back into the game. Xavi was able to thrive. As he began to demonstrate as the tournament progressed, Jordi Alba provided Spain with pace and width on the left. Perhaps what was more impressive in this game however, and what had been lacking in others was a slightly deeper starting position. With Italy trying to push high, Alba was positioned further back than he had been in earlier games. The deeper point with which Alba began provided him with the perfect platform to burst forward, that moment of explosiveness which is lacking when you start so high up the pitch. His goal was the perfect example. A driving run from a deep position showcased his ability and gave Spain the verticality which they have often been criticised for lacking. What had slowly surfaced in the group games and culminated against the Portuguese in extra time, continued from the outset here. Alba’s repeated drives forward are now key components of the Spanish system. It must be remembered though that Spain’s effectiveness in the first half was aided by the Italian’s pressing. Such pressing requires a high line and Spain took advantage of this. Prandelli brought on Di Natale for Cassano at half time and the Udinese frontman had an impact for the first 15 minutes of the second half until the unfortunate injury to Thiago Motta. With Italy trying to increase the tempo of the game, it became increasingly stretched and at one point Gerard Pique led a breakaway for Spain. This initailly favoured Italy more than Spain and Di Natale was presented with an excellent chance to bring Italy back into the game, being denied by a great save from Casillas. Di Natale made a number of runs in behind Spain, offering a different problem for Pique and Ramos from that which Cassano had presented. When Motta left the pitch with a hamstring injury, so to did any scant hope which Italy possessed to claw a way back into this game. As the second half wore on, Spain refused to ease up, introducing Torres, Pedro and finally Mata to stretch the rapidly tiring Italians further. Spain remained aggressive until the end. In many respects, Prandelli and Italy were undeserving of the final outcome and yet, it did not flatter Spain. The game as a contest was almost certainly over before Motta was stretched off after 60 minutes. Criticism of Prandelli for making the third and final substitution so early in the second half are wrong. Montolivo was tired and Italy needed fresh impetus to try and press Spain high up. Motta was the obvious choice. Despite this setback, the Azzuri must retain faith in Prandelli as these are the first steps, albeit vastly significant ones, on the route back towards success. The ghost of the 2010 World Cup has been exorcised. Spain produced their best performance of the tournament and deservedly walk away with the European Championship, entering the history books in the process. Unlike previous teams who had succumb to the narrow Italian midfield, Spain made some slight adjustments and prospered. No superlatives can adequately capture what Spain have achieved or in the manner in which they have done so. From Vienna to Kiev via Johannesburg. The final destination is known but the outcome remains unclear. Spain and Italy will meet for the second time at Euro 2012. The opening group game which ended in a 1-1 draw, was a slow, tactical affair with Prandelli surprising Spain with his use of a 3-5-2 system which provided the Italians with strength in the midfield and nullified the threat of the Spanish full backs. An in depth analysis of the opening group match can be viewed here. And so to Sunday and again, there will be much deliberation by Prandelli and how he lines up his side.The personal may be largely known but the system to be deployed is the key question which he must address. Whatever system is chosen, the same conundrums that have vexed opposing coaches throughout this tournament need to be addressed and answered. Firstly, how to contain Spain and thereafter, how to beat Spain. Prandelli faces one main issue ahead of this game. Does he stick with the loose 4-4-2 system with a diamond in midfield which has aided Italian success thus far or does he return to the 3-5-2 system which created so many problems for Spain in the opening game. That he has the luxury of using either system is both his fortune and his burden ahead of this game. Win and his tactical set up was correct. Lose and his tactics failed him. Such assertions can be wholly inaccurate but are thrown around as if gospel. The inability of those to understand that the result merely represents the final outcome and not what occurred during the game itself. Of course, a correct tactical system would be scant consolation should the result not favour you at this stage of the competition. Instead, Prandelli must choose which system can maximise Italian potential. Should Prandelli favour the 3-5-2, it’s likely to mean a recall for Maggio at right wing back with Balzaretti returning on the left. Balzagli, Bonucci and Chielini would form the defensive trio. The key question which Prandelli must then answer is who would he drop from Montolivo, De Rossi and Marchisio? The three have played well throughout the tournament and De Rossi and Marchisio offer the perfect screen for Pirlo, pushing forward onto opponents midfield and leaving Pirlo deep to circulate the ball. If the midfielders cannot push further up the pitch, Pirlo has less space to operate. If Pirlo has time, he will automatically look for the strikers with long passes as the Italians have sought to do throughout. The tactic was used repeatedly early in the game against England and achieved success in the first half against Germany. Cassano and Balotelli will remain as the two strikers, seeking to isolate the Spanish central defensive pairing of Pique and Ramos as often as possible, pulling them into the channels and the space vacated by the full backs pushing high. Although wing backs naturally start higher up the pitch, it’s highly unlikely that the Spanish full backs would adopt such conservative positioning again as they did in the first game. Could Maggio and Balzaretti push Albs and Arbeloa back? 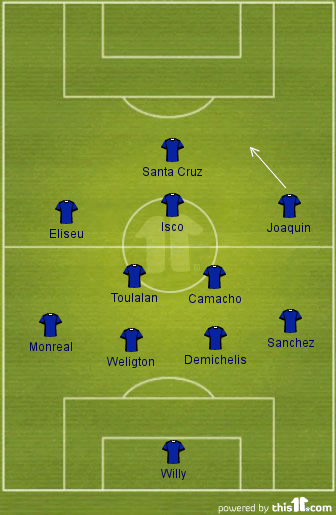 The other concern with the 3-5-2 would be the role that the central defenders fulfill if Fabregas starts. Who do they mark? Fabregas will drop deep and leave three central defenders with no clear role. The solution would be to start De Rossi in the back line again and Montolivo to retain his position in midfield but this loses the aggression and robustness of De Rossi from a central area which would be required to assist with breaking up Spanish attacks. Should Prandelli retain faith in the 4-4-2 diamond it allows the midfield trio to stay intact and push onto the Spanish. The downside though is the loss of width as the Italian full backs will be pushed back by the advancing Alba and Arbeloa. Abate could be recalled at right back if injury permits or the impressive Balzaretti may start here again. Maggio is too adventurous for a full back position and would be overlooked. Pirlo is also likely to be hindered by Fabregas dropping deep and occupying the space in which he operates. A reduction in his possession will limit his ability to influence the game. Spain will line up with their normal 4-3-3 with the usual questions surrounding two positions; the striker and the right sided attacking berth. And yet it seems so obvious that del Bosque will opt for Fabregas in the false 9 role to establish control. The thought of Pirlo controlling another game from deep must be anathema to the Spanish. Fabregas will, as we know by now, drop deeper than Torres and link with the midfield. To combat the Italian numbers in midfield, Fabregas must start and drop deep to provide options. One of the successes of the Spanish game at this tournament as been the manner in which they press quickly to regain possession in a structured fashion. There will be no set instructions for someone to press Pirlo. Whoever is nearer from a fluid midfield must take responsibility and close him down. This could mean Fabregas if central or Iniesta and Silva when tucking in from the wings. Silva continues to deliver and yet infuriate on the right wing. With one goal and three assists to his name, Silva has played a major role in Spain’s progress to date. Doubt lingers though over what he could be doing. The need for an extra touch sometimes when a simple, quicker pass would be the more profitable option. Del Bosque has removed Silva in each game thus far. Alba and Arbeloa must advance for Spain. Italy are very narrow and whilst Spain are often accused of a similar failing, they have the ability to change and alter this via Navas and Pedro if need be. 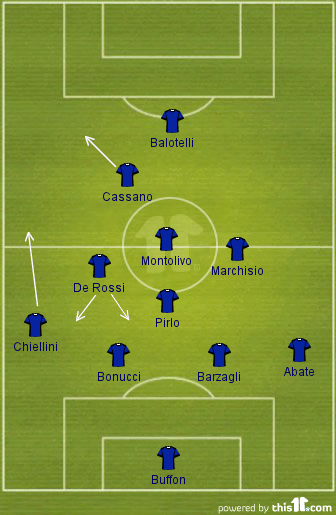 In the first instance though, the full backs must push high and stretch the narrow Italian midfield. Judging by the reaction to the performance of Andrea Pirlo against England, you may be somewhat surprised to learn that Pirlo is in fact 33 years old with a long and distinguished career behind him which includes most major titles. Except that of European Champion. The performance of Pirlo against England was often majestic as he glided around the center of the pitch with considerable ease, spraying the ball around and dictating the play. The clamour for him to be crowned player of the tournament has grown steadily aided by another performance infused with class against Germany. If there is a player who can prevent Pirlo from collecting this individual award, he is lining up opposite Pirlo in the shirt of la furia roja, the man who calmly states that the ball is “my friend”; Andres Iniesta. The Spanish No8 remains one of the few players from la seleccion to have escaped criticism during this tournament. Possessing the ability to accept the ball under pressure and invite challenges before releasing it, Iniesta has provided Spain with a constant driving presence from the left thus far. From within the seemingly relentless passing of the Spanish midfield, Iniesta will break and surge forward and commit defenders creating space for team mates. Although not in direct competition, the battle between the winners of the Man of the Match awards from the past two World Cup Finals, promises to be something special as they seek to shape and influence the game. And so, we journey to Kiev. A Spain win brings footballing history. Three successive international trophies, the first team to successfully defend their European Championship crown. Winning the trophy brings much more however. It cements Spain’s place in the pantheon of the greats, rightfully taking their place amongst the winners in the history of the game. The pantheon contains more than just winners however. For some teams are fondly recalled for the manner in which they played, their legacy cherished by all who were fortunate enough to glimpse these teams at their footballing peak as they defined an era irrespective of whether they won or not. Spain will be spoken of alongside the free flowing Brazil of 1970, the total football of Cryuff and Holland in 1974 and 1978, Brazil in 1982 who remain arguably remain the greatest side never to win the World Cup, France in 1998 and 2000 guided by the genius of Zidane. And now Spain in 2008, 2010 and 2012. This is the era of tiki-taka. Spain are standing on the brink.